Welcome to my Field Agent App review! Field Agent is an App which claims that you can make money with your Android device by completing small jobs near your residence. Is it really that easy? Is Field Agent App worth your time? And most importantly, is it a legit or a scam? That’s all I will be covering in this Field Agent App review. Best For: People who are looking for side income. Summary: Field Agent Is an App where you could only use it to make a side income. The app lets you know small tasks near your area, and you need to complete those. By using this, you can expect to earn $30 to $50 per month. What is Field Agent App? 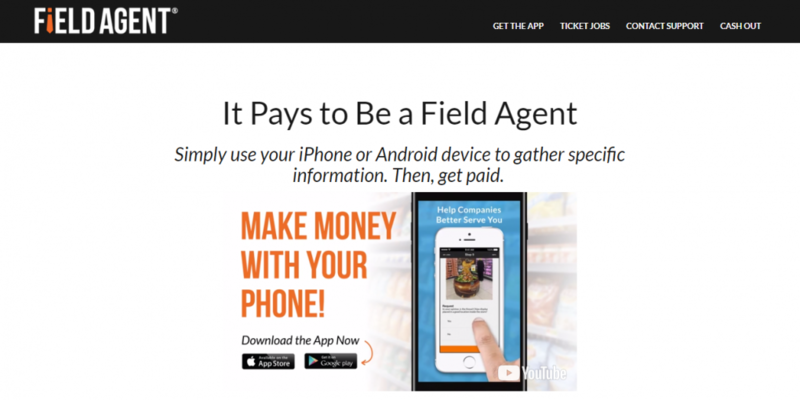 Field Agent is an app that pays you for becoming a field agent. After becoming an agent, you will be asked to use your smartphones to take photos, videos and other information from stores near your residence. Businesses use the information collected by the agents so they can serve customers better. For many companies, the data collected by agents can make or break a company. This information let them know the companies to improve their products. Making money from apps is not a new concept; you could read my other apps reviews that could also make a side income for you. The apps are; dosh, drop, zap surveys and ibotta. However, you couldn’t expect much from apps, and if you want to make a full-time income from home, I suggest you see my #1 recommendation, i.e., Wealthy Affiliate. How Does Field Agent App Work? First, you need to download this app. Field Agent is currently available on IOS and Android devices. Just visit the iTunes App store or the Google Play store. After visiting those stores, you can also search for “Field Agent” to find the app. The next step is to complete your sign up process. If you are accessing this app for the first time, you will be asked to fill out a few profile questionnaires (age, gender, home zip code, etc.). You are advised to answer these questions accurately as they're critical for becoming a Field Agent. Now it’s time to come to your main mission. Select "Find Jobs" from the main navigation window. There are different jobs available and locate available jobs on the "jobs list," or select "map view" to quickly see job locations. For additional details, click on the jobs either to accept or reject them. Once selected, you'll have less than 2 hours to complete the job, so be sure you're in the close vicinity. Some jobs may also require traveling as well. Jobs typically pay between $1 to $10 each. The money you make with Field Agent is accumulated in your Field Agent account until you decide to withdraw. Based on the stats gathered in 2016, the average app user earned between $200 to 500 per year. How to Cash Out Your Earnings? Utilize an easy method of Direct Deposit. The app doesn't offer PayPal option, perhaps one of the major drawback of this app. However, the other two options are good too. 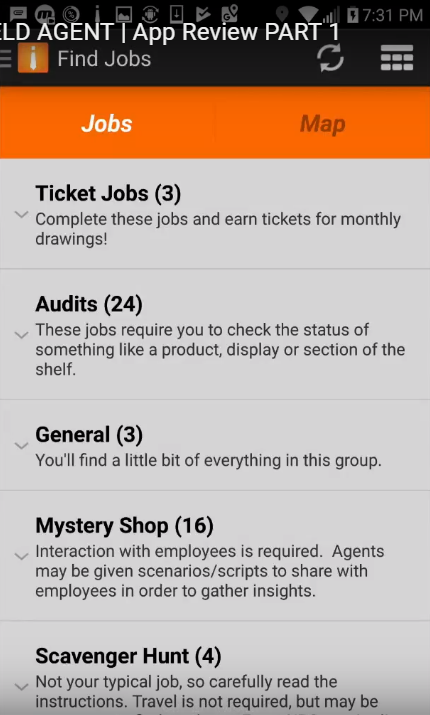 A variety of jobs are accessible through the Field Agent app. Common jobs comprise of price checks of products, in-store display checks, and customer surveys. The app may, for instance, ask you to go to a selected store, find a particular product, get a photo of it, and, then, answer a few questions about the product (e.g., Price of the product). Apart from this, Consumer surveys can often be exercised from anywhere, and are meant to help companies better understand consumers like you. The biggest issue with this app is that people often face nonavailability of jobs. It may be due to all the jobs for your area have been reserved, or there aren’t jobs currently available. Most of the jobs are state, ZIP code, or even store specific and you could only expect those jobs when you are within those parameters. Jobs are posted based on the demands of the clients, so you can't always predict where or when new jobs will be available. Visit their jobs portal regularly, and you could find later on. Further, if you are from rural areas, you shouldn’t expect many jobs. Once you complete a job, sometimes you have to wait for few days to see money credited into your account. • Gray Question Mark - It means the job is under pending review. • Green Mark - It means your job was approved and any money earned from it is available to cash out. • Red X Mark - It means your job was denied because either it was incorrect or incomplete. If this happens, you could expect to receive an email explaining why this job is rejected. So make sure to check your email associated with your Field Agent app. If the app experienced a higher number of jobs, you could expect the jobs may take even a week to be approved. That’s pretty annoying for the agents. Yes! You should expect only a side income from Field Agent App. This isn’t something that makes you rich or earns you something that you are dreaming about. If you are happy about earning $30 to $50 per month, this app is for you. Otherwise, I recommend you to join my #1 recommendation. Even you have to spend a good time completing those tasks. Field Agents are complaining about increasing the time and effort to complete jobs while reducing payouts. Each job has a certain set of instructions that you need to follow and believe me; those are strict. If you get to mess up those things, it can cause the job to be rejected. I have also seen a good number of agents is complaining about this issue. So, be ready for the jobs to be rejected and you wouldn’t get paid. Making money from apps is not something worth your time. That's why i recommend Wealthy Affiliate to anyone. Read Wealthy Affiliate Review Here! When you join this app, your agent score is 85 points, accumulating more as jobs are completed. Your Agent Score determines what jobs you’re offered in the future. If your score falls below to 75 points, you will no longer see jobs. This score (also called ratings) is meant by how trusted you are, whether or not you complete the job correctly and on time, etc. The higher your ratings, the better chances you have of acquiring higher paying tasks. Don't forget; you only have two hours to perform a job after you accept it, so don’t accept one if you don’t think you can finish by the deadline. It will harm your ratings. Understand the requirements: Carefully read the instructions for each job to understand them completely. Don't rush over it. Take photographs carefully: Most of the times you aren't allowed to take photographs of the products as it may be against store policy. If you get caught, you may be asked to leave. And if you are, do so quietly and politely. It is suggested that you should keep your phone mute so people around you can’t hear your camera’s sound. Try wearing headphones, so it looks like you’re only listening to music. Choose jobs wisely: You should keep in mind that certain jobs require transportation. So be careful in choosing jobs so that they aren’t too far out of your way. Take pictures carefully: Don't zoom pictures as it can negatively affect photo quality and resolution. You may also inadvertently crop out an important part of the picture, which can result in a refusal of that job. Double check: Double-check for accuracy before submitting a job. You cannot redo jobs that were done already. Glitches: You could also expect glitches in the app, try turning it off, then start again. If the problem continues, try uninstalling and reinstalling the app. Be persistent: For the first few jobs, you could expect a few rejections. Don’t give up; there is a learning curve. More jobs: If you want to see more jobs, go to Job Filter and try increasing your job radius. 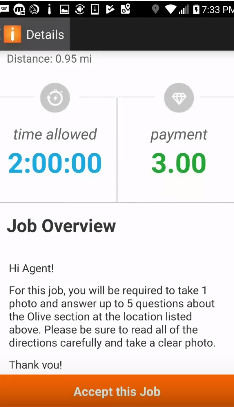 Is Field Agent App a Scam or Legit? Field Agent is a legit app where you can expect to earn $200 to $500 per year. You need to spend at least 1 to 3 hours per day. If you still think it is worth your time, go ahead. In my opinion, I don’t recommend this, and it is worth mentioning that if you put your focus more on the other best options available, you could expect much more than that. Wealthy Affiliate is a platform that I am using since 2015 and also created this blog after joining this platform. Now, I have different sites earning me passive income each month. I hope you will like my Field Agent App Review and if there is any question in your mind, please ask me in the comment section.